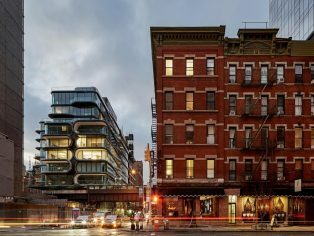 Photographers Hufton+Crow have documented 520 West 28th, Zaha Hadid Architects’ first project in New York City. 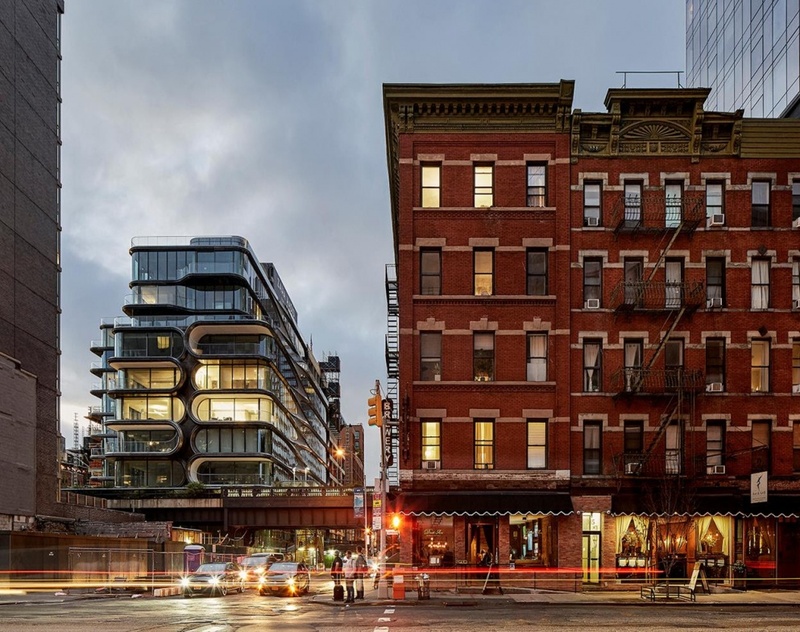 There is a powerful urban dynamic between the streets of New York and the High Line, a layered civic realm that has developed over generations and in many iterations. 520 West 28th conveys this contextual relationship, applying new ideas and concepts to create the latest evolution of the site’s rich history. The split levels of the design define varied living spaces and echoes the multiple layers of civic space on 28th Street and the High Line. These split levels are expressed within the interlocking chevrons of 520 West 28th’s hand-crafted steel façade which carries the spirit of Chelsea’s industrial past; its detailed workmanship continues the venerable tradition within New York’s historic architecture of enhancing the public realm. Designed and constructed with a practiced understanding of material qualities and manufacturing techniques, the façade conveys the attention to detail evident throughout 520 West 28th—brushed and tinted by hand to resonate with the adjacent structures of the High Line and its neighbourhood. The 11-storey 520 West 28th houses 39 residences with 11-foot coffered ceilings, tailored interiors that incorporate Boffi kitchens by Zaha Hadid Design, and integrated technologies including automated valet parking and storage. With multiple cores to give most residences private elevator lobbies, the amenities of 520 West 28th include the wellness level with spa and 25-yard sky-lit lap pool, sculpture garden, and entertainment suite with IMAX theatre. Within an established community of over 350 art galleries that has seen the High Line’s transformation from abandoned freight rail line to public park, 520 West 28th embodies a commitment to uphold the distinctive character of its neighbourhood; creating a building with its own architectural presence, yet very much of its surroundings.